It attacks from afar and moves around very little. It is very magic-resistant and nullifies all attacks while taking on its mask form. The cursed flame it occasionally unleashes firmly chases its target, but it can be used advantageously with reaction commands! The Shaman (シャーマン, Shāman?) is an Emblem Heartless that is found in Kingdom Hearts II. The Shaman casts magic and is resistant to magic. Sometimes they are found riding on top of Living Bones, another Heartless found in the Pride Lands. A Shaman is a thin, monkey-like creature with predominantly black fur, except for the fur on its arms and its long, prehensile tail. Its hands, feet, and ears are all white, while its claws are black. It wears small, yellow and blue bracelets and anklets, as well as a dark red tunic over its upper body. Most notably, the Shaman wears a mask that covers most of its face, save for its ears and glowing, yellow eyes. This mask is mostly white with brown edges, orange and yellow markings in its sides, and a jagged mouth. It also has two twisted, sky blue horns on its top and a long, bent protrusion resembling a beard sprouting from the mask's chin. 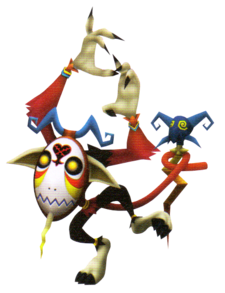 Its Heartless emblem is on the forehead of its mask, and it carries a staff known as the Shaman's Relic for its magic, usually holding it in its tail. 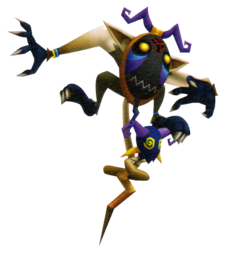 In Kingdom Hearts II Final Mix, the Shaman's fur is mainly brown, save for its tail and arms, which are tan and white, respectively. Its hands and feet are black and its ears are tan. Its mask is black with sky blue and violet markings on its sides, violet horns on its top, and a violet "beard". It also carries a Spell's Relic, a palette swap of the Shaman's Relic. The Shaman's name refers to shamans, people who were supposedly mediums for spirits. The Shaman becomes invincible during the duration of a curse. When atop a Living Bone, the power of a curse is increased greatly, and can even take out a high level character if not careful. If a Shaman and Living Bone with a head spawn separately, then the Shaman will teleport itself onto the Living Bone and ride it if given the chance. As mentioned above, a Curse while on Living Bones can be disastrous. The best choice would be an immediate Trinity Limit; however, this is not an option in Lion Form. It can, however, be a lifesaver in the 45th fight of the Hades Paradox Cup, in which Sora must fight alone.